City planners have given the green light to next phase of the £600m Masshouse scheme in Birmingham city centre. Manchester-based developer Nikal is behind the project which has already seen the &apos;Masshouse&apos; and &apos;Hive&apos; towers deliver 340 apartments and the demolition of the Masshouse Circus traffic island in 2002 to accommodate them. It is now forging ahead the development of &apos;Plot 3&apos; - a part three- and part seven-storey building to contain a studio, four one-bedroom and 10 two-bedroom apartments as well as a ground floor retail unit. 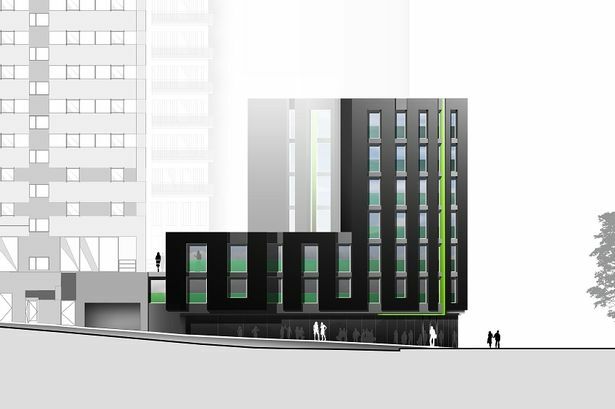 This phase, which will occupy a 2,000 sq ft footprint and be called &apos;Hutong&apos; after the small neighbourhoods found in Chinese cities, was approved by members of Birmingham City Council&apos;s planning committee today. The site benefits from its proximity to Bullring and Eastside and the planned HS2 station in Curzon Street. Nikal&apos;s development director John Moffat said: "It is clear from the overwhelming success of Hive that there is a genuine appetite in the market for good quality, design-led residential units. "This is particularly true in Eastside, which is rapidly becoming one of Birmingham&apos;s most desirable destinations with the delivery of HS2 and continued investment in the area. "We chose the name Hutong as it is reflective of intelligent use of spaces, organic growth and the creation of a thriving neighbourhood atmosphere. "Hive was such a huge success with both owner-occupiers and buy-to-let investors that we converted some of the unused ground floor retail space into another phase of apartments to meet demand." Property agency Knight Frank has been appointed to bring the apartments to the market. Last year, Nikal received outline planning permission for the mixed-use &apos;Exchange Square&apos; project on land adjacent to Masshouse Plaza. The initial outline planning application for the £600 million Masshouse scheme was lodged in 1997 and contained plans for retail, leisure, cinema, health and hotel uses.